If you're looking for a quiet beach retreat, Watch Hill more than has you covered. No party houses, no rowdy bars: just you and the beautiful beach. Watch Hill is run by the National Park Service as part of the Fire Island National Seashore. Because of this, construction on the land is just the necessities: store, restrooms, boardwalks, restaurant, and employee housing. To stay overnight, you better know someone with a sleeping cabin on their boat or be ready with your camping gear. Lifeguards are provided for a safe beach experience and local wildlife abounds in the pristine wilderness. Camping at Watch Hill comes in two forms: tent campsites and wilderness camping. More information about wilderness camping can be found through the National Park Service, where you can make reservations and obtain any necessary permits. You can conveniently make reservations for camping and marina slips online! 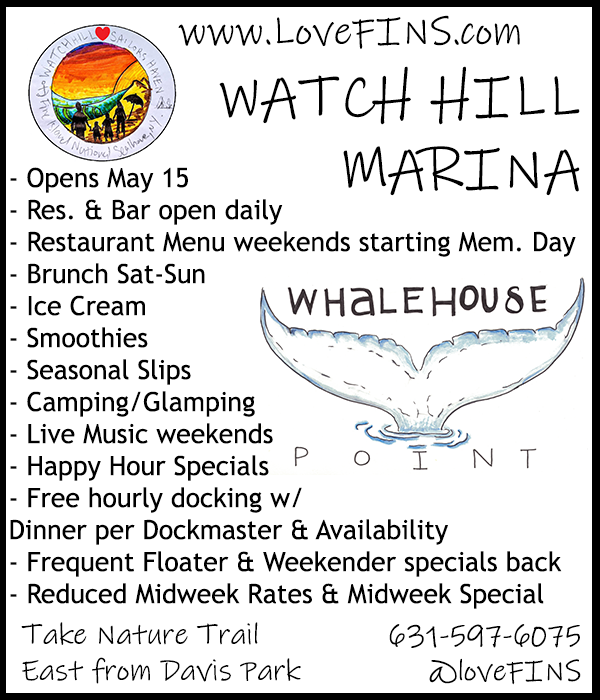 Make sure to stop by the newly reopened Snack Bar, scooped ice cream stand, and the brand new Whalehouse Point Restaurant, with live music and events happening throughout the summer! Whether you come for the day or camp out, be sure to enjoy the scenic nature trail that winds through the wilderness and along the water. Stop by the visitor center for more information on family programming as well. For more information on concessions at Watch Hill, please visit their website.